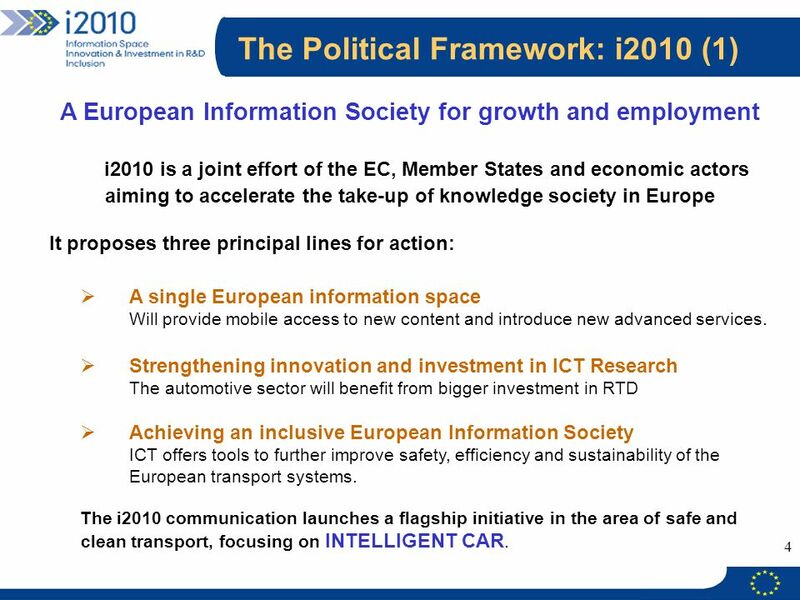 A European Information Society for growth and employment i2010 is a joint effort of the EC, Member States and economic actors aiming to accelerate the take-up of knowledge society in Europe It proposes three principal lines for action: A single European information space Will provide mobile access to new content and introduce new advanced services. 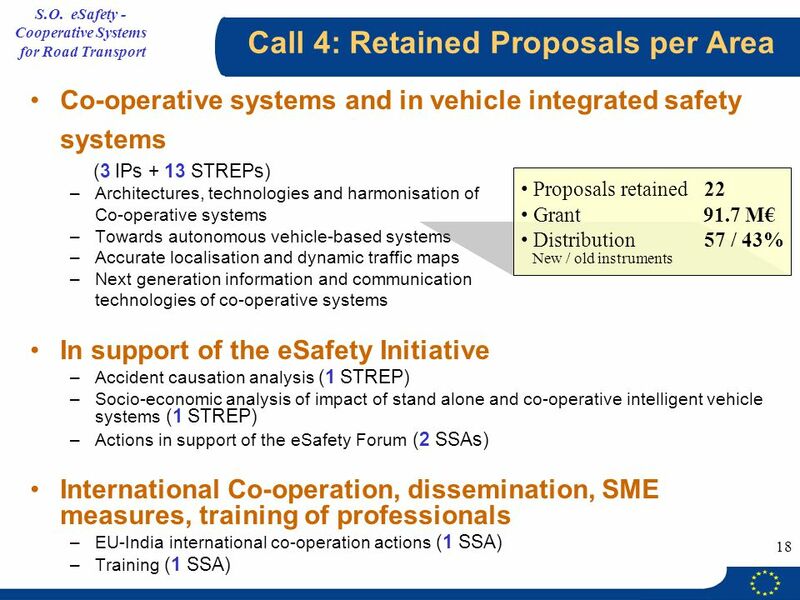 Strengthening innovation and investment in ICT Research The automotive sector will benefit from bigger investment in RTD Achieving an inclusive European Information Society ICT offers tools to further improve safety, efficiency and sustainability of the European transport systems. 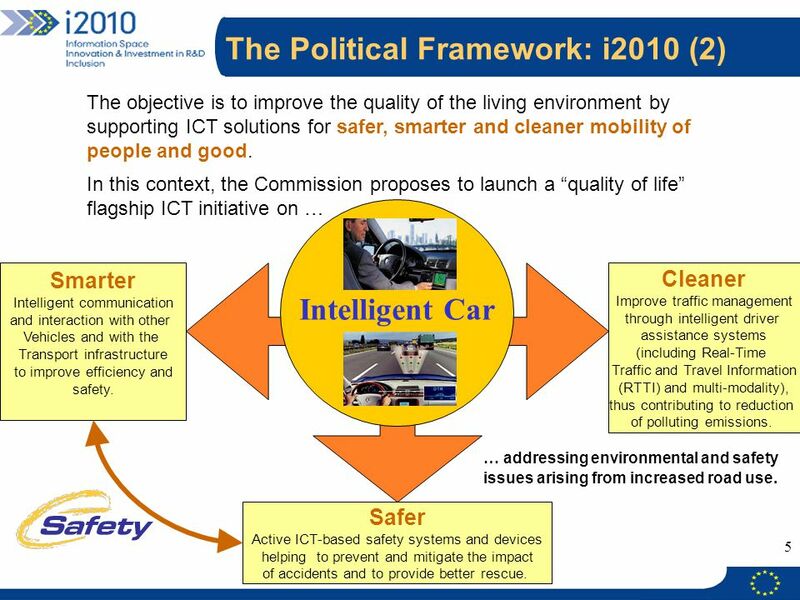 The i2010 communication launches a flagship initiative in the area of safe and clean transport, focusing on INTELLIGENT CAR. 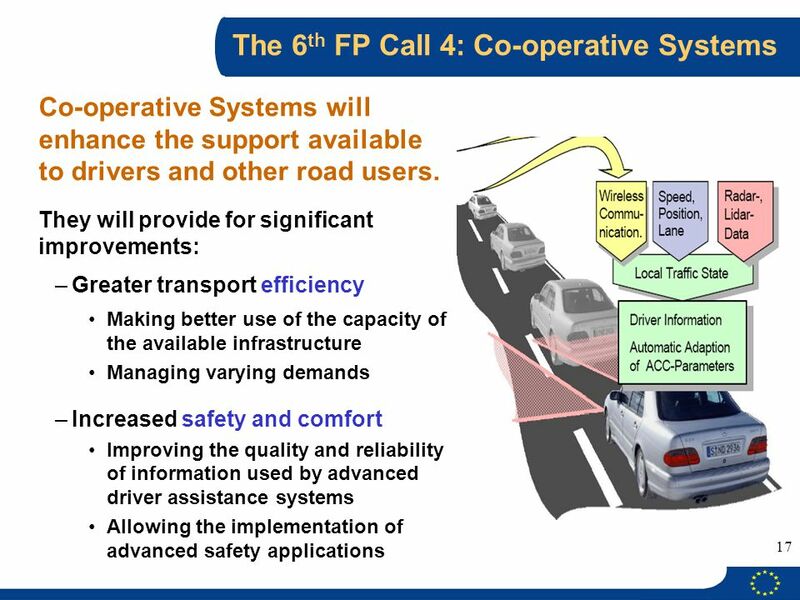 The objective is to improve the quality of the living environment by supporting ICT solutions for safer, smarter and cleaner mobility of people and good. 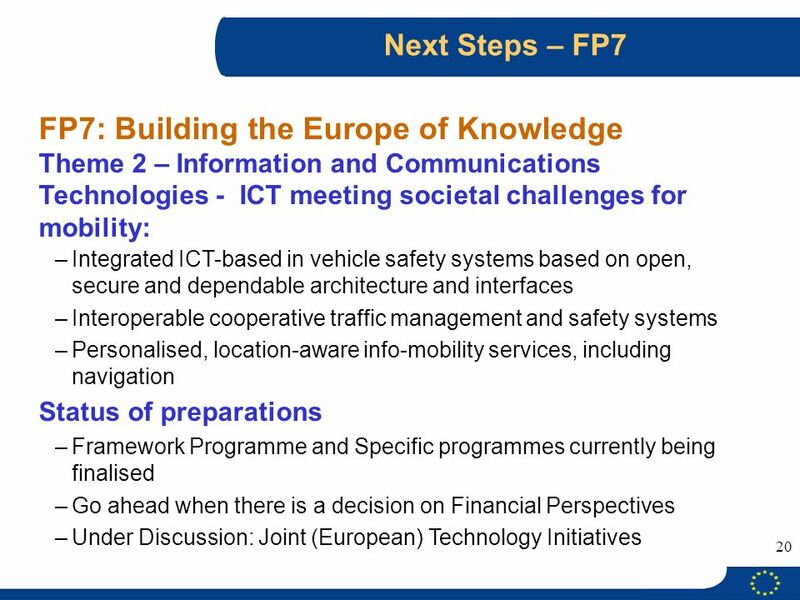 In this context, the Commission proposes to launch a “quality of life” flagship ICT initiative on … Intelligent Car Smarter Intelligent communication and interaction with other Vehicles and with the Transport infrastructure to improve efficiency and safety. 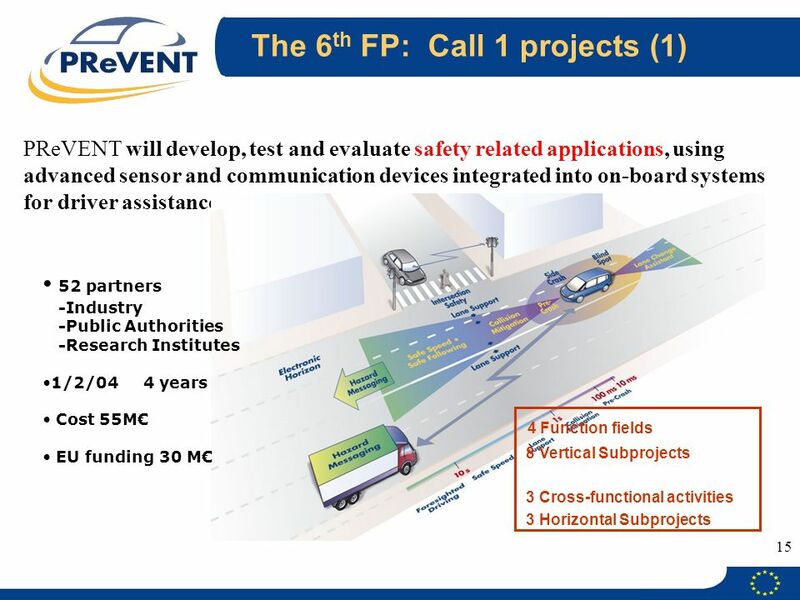 Cleaner Improve traffic management through intelligent driver assistance systems (including Real-Time Traffic and Travel Information (RTTI) and multi-modality), thus contributing to reduction of polluting emissions. 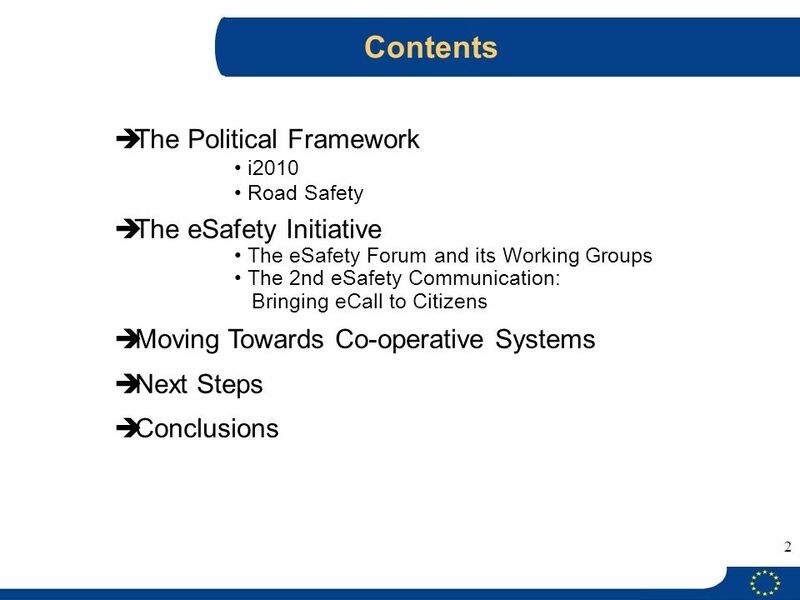 … addressing environmental and safety issues arising from increased road use. 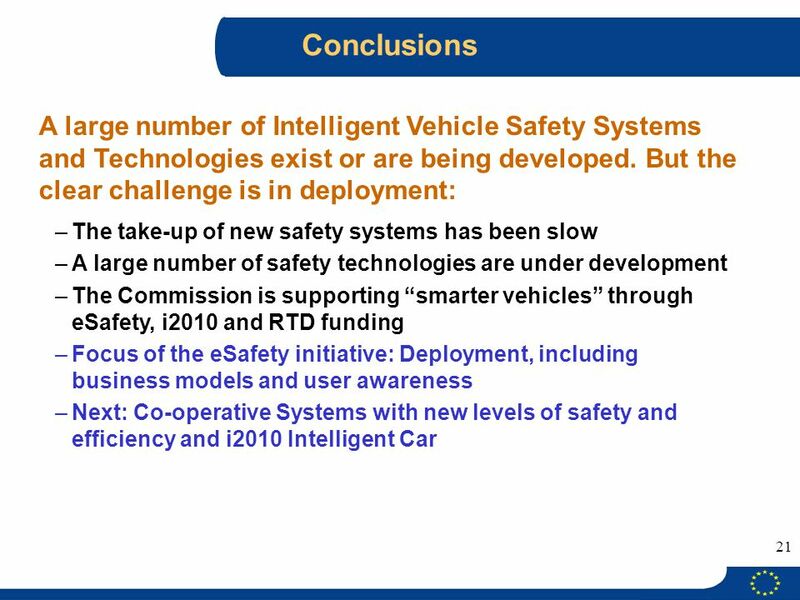 Safer Active ICT-based safety systems and devices helping to prevent and mitigate the impact of accidents and to provide better rescue. 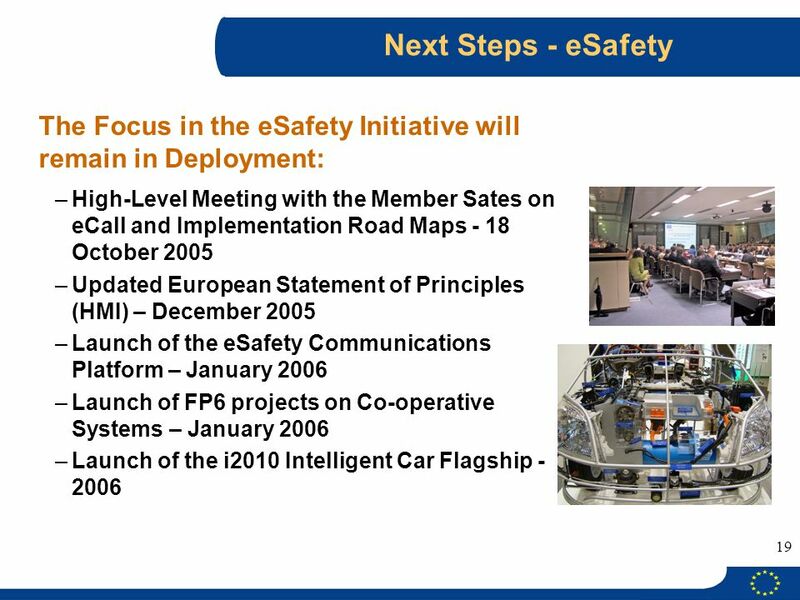 The eSafety Initiative was launched in 2002 as a joint initiative of the European Commission, industry and other stakeholders. 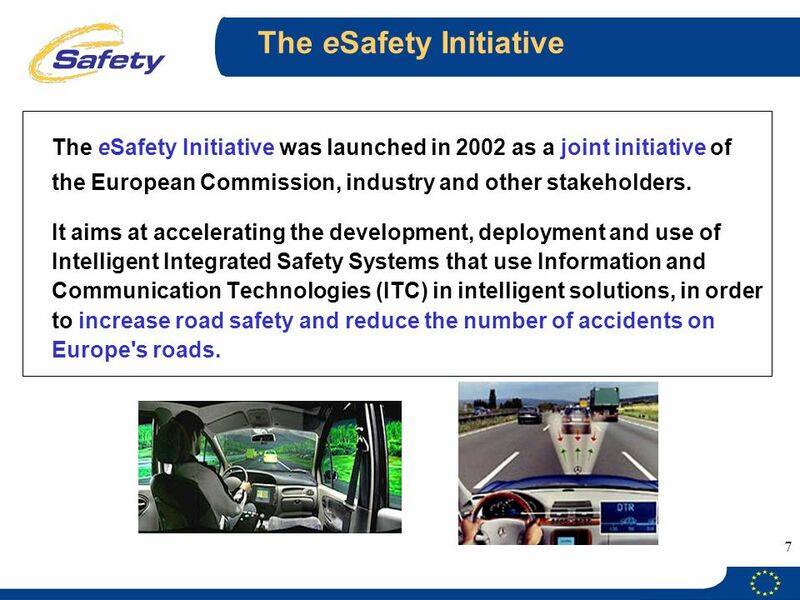 It aims at accelerating the development, deployment and use of Intelligent Integrated Safety Systems that use Information and Communication Technologies (ITC) in intelligent solutions, in order to increase road safety and reduce the number of accidents on Europe's roads. 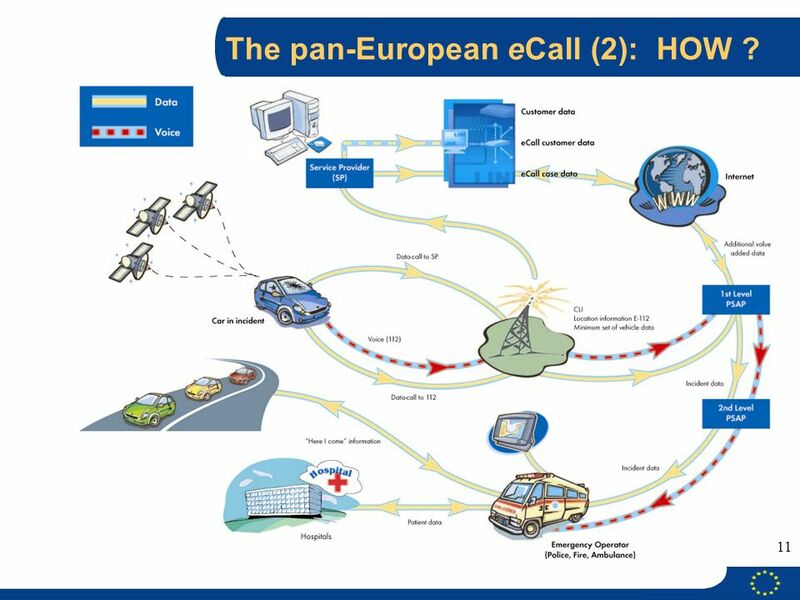 10 The pan-European eCall (1): WHY ? 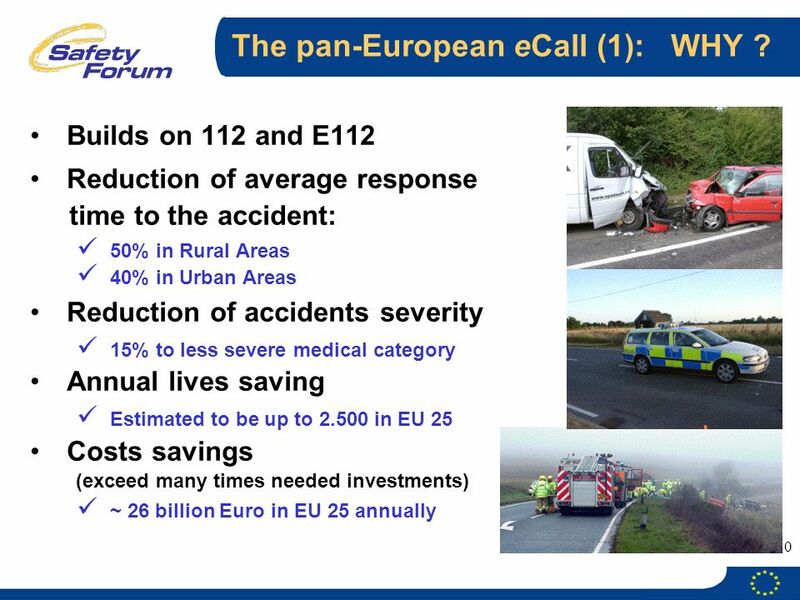 11 The pan-European eCall (2): HOW ? 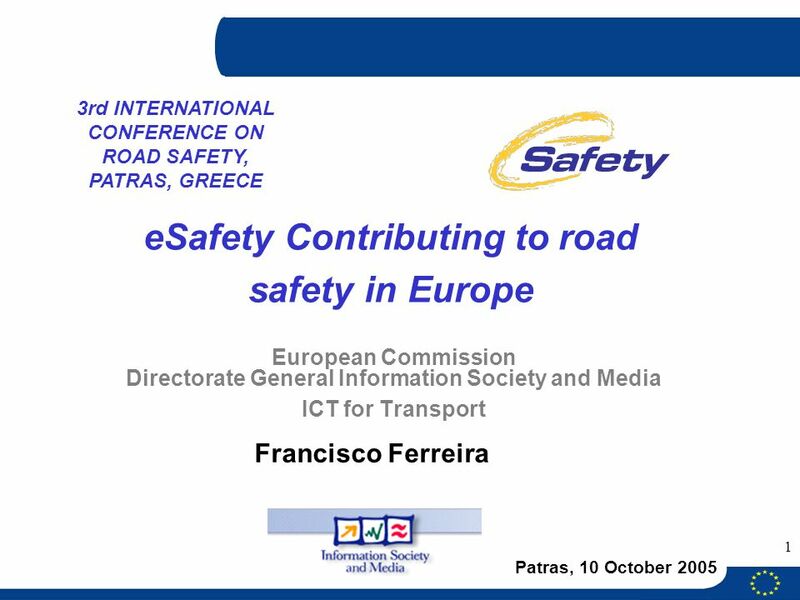 Download ppt "eSafety Contributing to road safety in Europe"
GREEN PAPER "TOWARDS A NEW CULTURE FOR URBAN MOBILITY" EUROPEAN COMMISSION. 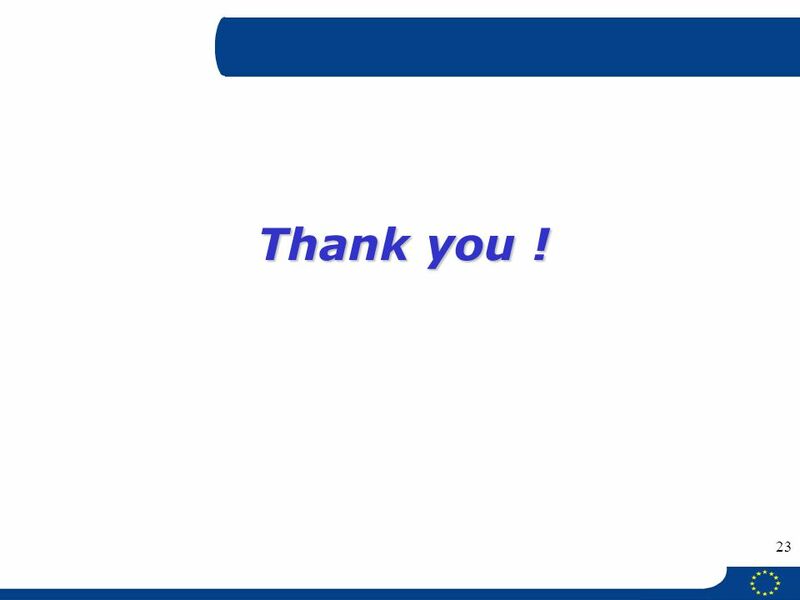 E-Safety 29 April 2002 e-Safety High-Level Meeting Brussels 25 April 2002 CONCLUSIONS. 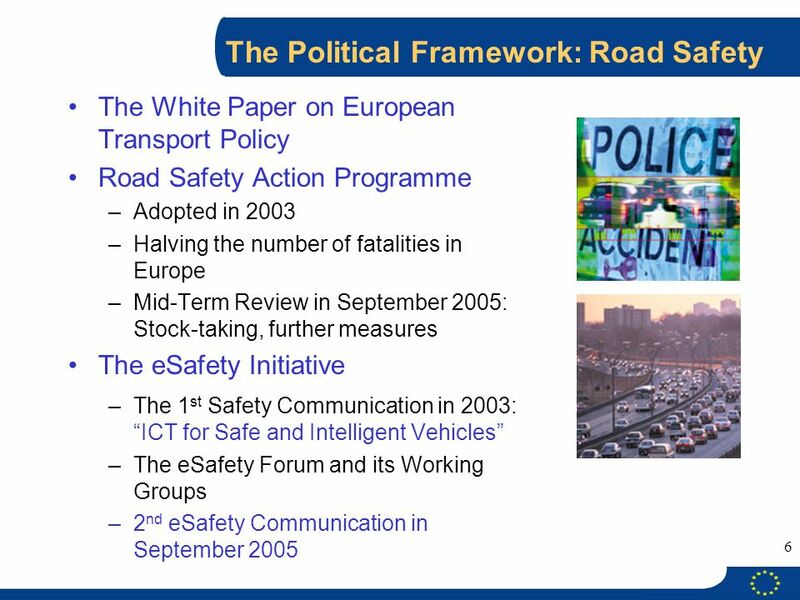 1 Towards a comprehensive eSafety Action Plan for improving road safety in Europe Erkki Liikanen 25 April 2002. 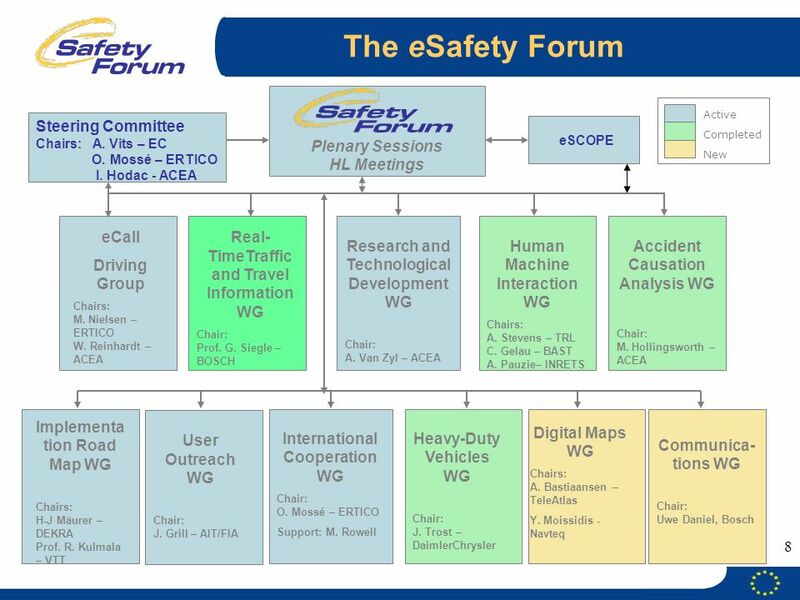 ESafety Work Programme WORK PROGAMME 2004 The eSafety Steering Group, Brussels, 10 February 2004 The eSafety Steering Group, Brussels, 10 February. Dr. R. Zobel – Gothenburg – 15 th Nov Gothenburg Ministerial Conference Towards a Knowledge Society –The Nordic Experience The role of ICT for jobs. 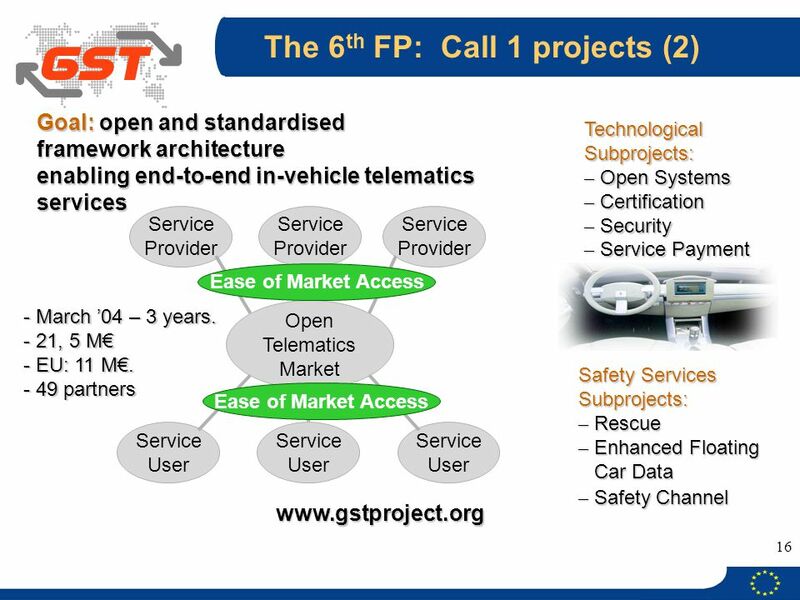 Field Operational Tests in 7FP Fabrizio Minarini Head of Sector DG INFSO - ICT for transport. 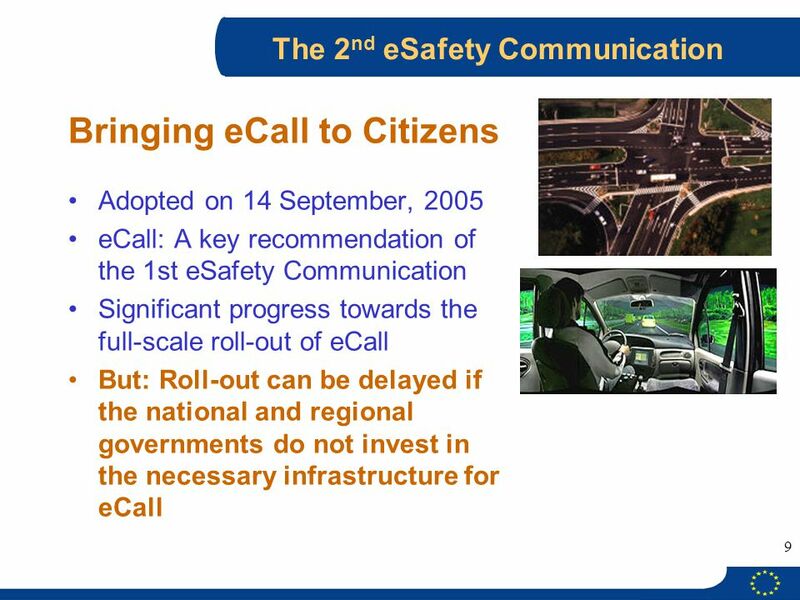 European Commission Directorate General Information Society and Media Unit ICT for Transport Juhani Jääskeläinen, Deputy Head of Unit eCall: Car that can. 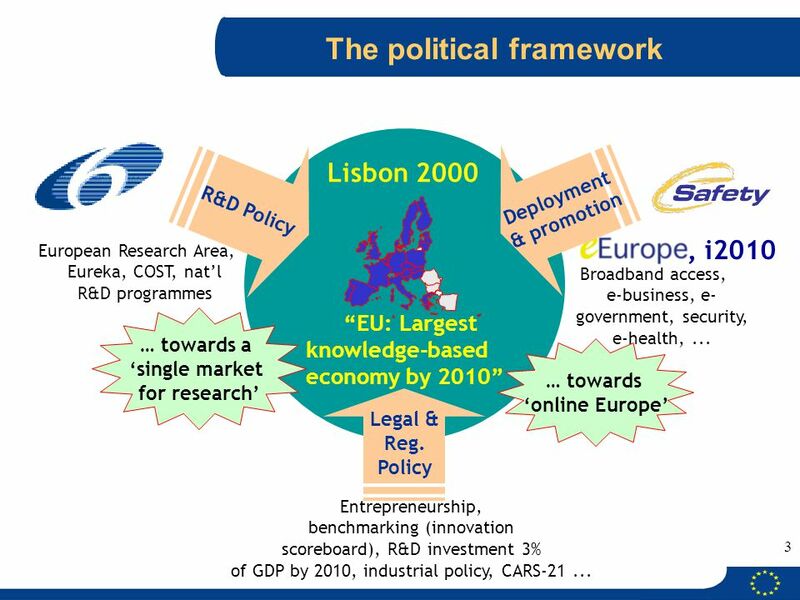 9th Grove Fuel Cell Symposium, 6th October 2005 Sustainable Energy Systems Slide n° 1 7 th FRAMEWORK PROGRAMME BUILDING THE EUROPE OF KNOWLEDGE European. 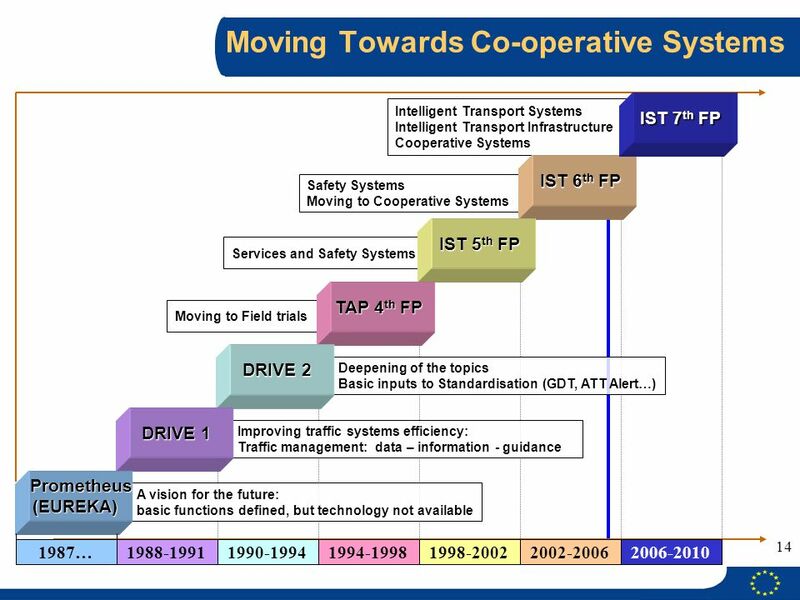 Vehicle-infrastructure integration: creating co-operative mobility systems and services Hearing EU Parliament, 22 January 2009 Hermann Meyer, CEO. ICT Work Programme NCP Infoday 23 June Maria Geronymaki DG INFSO.H.2 ICT for Government & Public Services Objective. 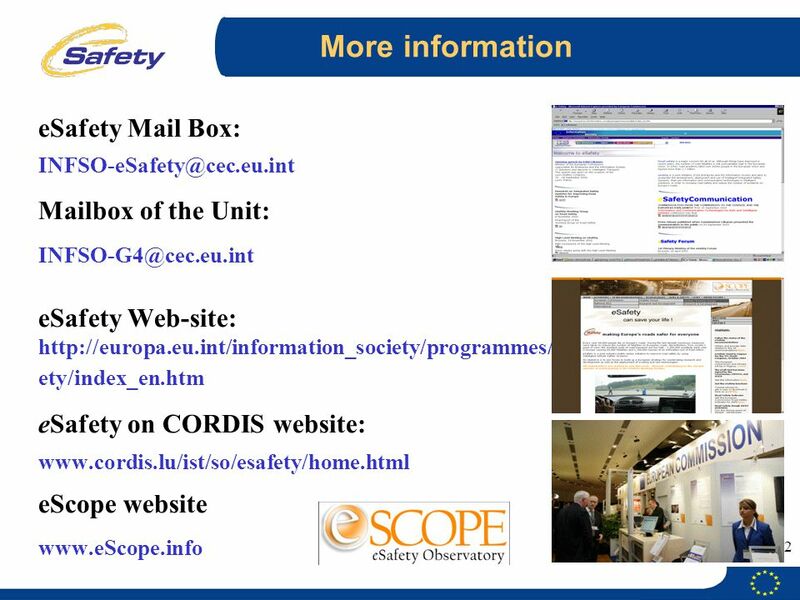 Annie Lalé of SQUARIS  FP7 Themes Relevant for Safety and Security  Focus of Research Projects in Emergency and Disaster Management  ICT Themes in FP7. EF_to_PELC-05_11Apr PELC 2005 Den Haag, 11 April 2005 Options for Process Industry Collaboration within the European Research Programmes Dr Erastos. Policy Research and Innovation Research and Innovation A perspective Transport Research & Innovation - through collaboration to tomorrow. 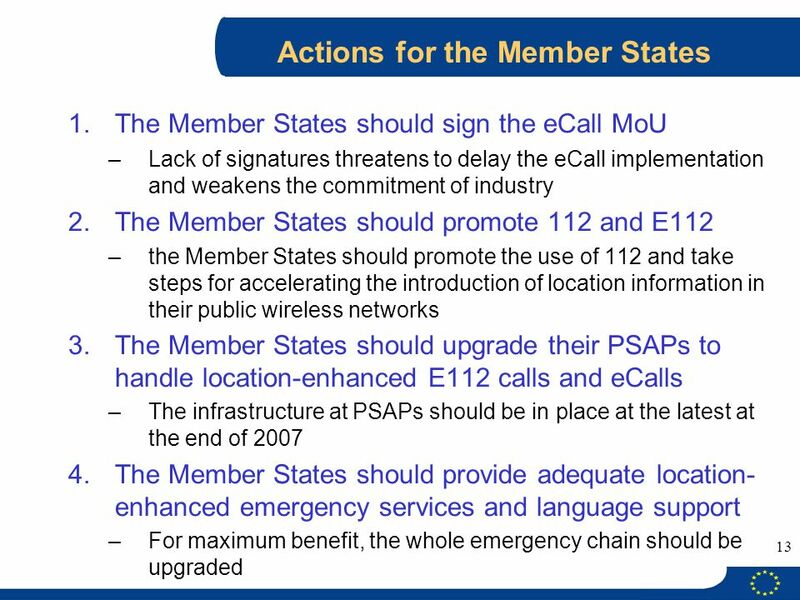 Provisional draft European Commission Directorate General Information Society and Media Unit G.4 - ICT for Transport Wolfgang Höfs Unit G.5 - ICT for Environment. 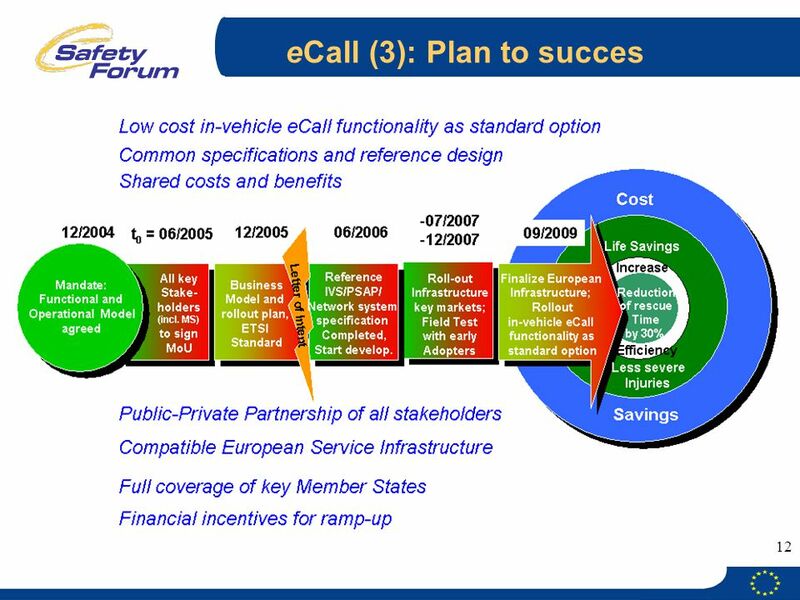  Road Safety the European Union Policy Carla Hess European Commission, Directorate General for Mobility & Transport Road.